The Los Angeles Chargers paired good defense with good special teams and came away with the 21-0 win over the Denver Broncos in the StubHub Center. Wide receiver and return man Travis Benjamin made big plays for the Chargers throughout the game, scoring two touchdowns, one a punt return and another on a long catch-and-run. The Broncos defense limited QB Philip Rivers to just 183 yards through the air and generally did a good job limiting the Chargers tandem of running backs, Melvin Gordon and Austin Ekeler, but the Denver offense could not find a way to effectively move the ball. 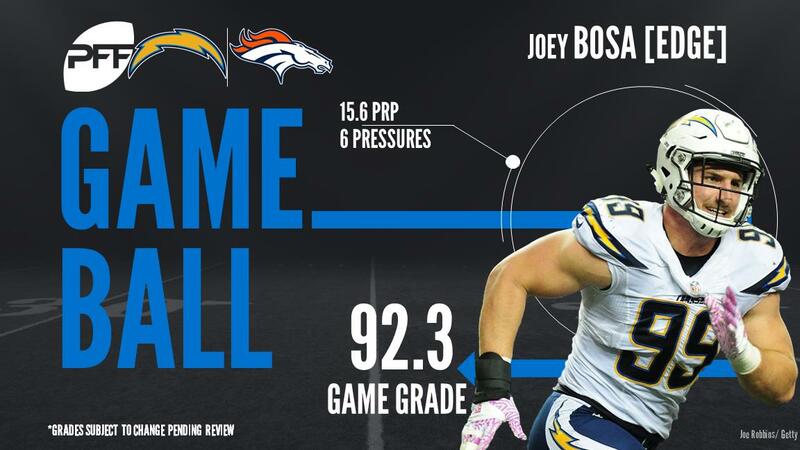 QB Trevor Siemian was just 19-of-29 for 158 yards himself, although his day was made much harder by the dynamic pair of edge defenders, Joey Bosa and Melvin Ingram, and a great defensive performance overall. RB C.J. Anderson did a solid job running the ball with 44 yards on just 10 carries, but the Broncos could not feature him often, finding themselves down by double digits by the middle of the second quarter. Even though the Broncos did a good job of limiting both Chargers running backs, Ekeler was the slightly more successful runner out of he and Melvin Gordon. Although he had to fight for every yard and gained 27 of his 37 yards after contact, all of Ekeler’s runs went for a gain and he also broke a tackle on one of his seven carries. Furthermore, he had the third most targets on the Chargers offense as he caught all four of his targets, including a touchdown pass. Rivers was under duress in the entire game against the stout Broncos defense, as he was under pressure on more than half of his dropbacks. However, his performance did not drop off when he was under pressure, as he was still able to complete a third of his passes and earned a passer rating of 90.3 on these plays. In order to avoid some of the pressure, Rivers tried to get rid of the ball as quickly as possible and as a result only 7 of his 23 attempts traveled 10 or more yards from the line of scrimmage. Bosa was nearly unblockable rushing from his defensive end position. Bosa tallied six pressures, including two sacks and a quarterback hit. He did a lot of his damage rushing from the left side of the offensive formation. He and the other Charger rushers ability to flush Simian and throw off timing was the difference in the game. Addae yielded five receptions for 34 yards, but it was his ability to make plays with the ball in the air and come up and stop the run that made him shine, as he finished with two run stops. Addae and the Chargers defense got the Broncos offense off of the field on third downs all game long. Siemian finished 25-of-35 for 208 yards and an interception, he also had a drop and was sacked five times. Semian did not complete either of the two passes he attempted deep, which is a throw targeted 20 yards or more downfield, and was 2-of-7 on pass attempts under pressure for 33 yards. The Broncos offense never got in rhythm and Simian was in a hurry to get rid of the ball versus the Chargers pass-rush. The first-round tackle surrendered only one sack but he was beaten bad at times in pass protection. Bolles had a tough assignment and will need to improve his pass protection to turn in a solid rookie campaign. Even though Philip Rivers did not attack the Broncos secondary on deep passes, Talib was still able to impress with his work in coverage. Whereas, he was targeted four times – tied for the most on the Broncos – Talib allowed just one reception, which was a backfield swing pass to Austin Ekeler for 3 yards. Furthermore, Talib also broke up one of the passes going his way and as a result Rivers had a passer rating of 39.6 when targeting Talib, which is the same as throwing the ball into the dirt on every pass. While Miller was on the losing side against the Chargers, that does not mean he was not wreaking havoc on nearly every play against the Los Angeles offensive line. Miller had success in setting the edge against run and was one of the Broncos’ best run defenders. However, he also showed off his signature pass-rushing moves as he picked up a total of nine pressures, two sacks and seven quarterback hurries, on just 27 pass-rushing snaps and he did not miss a single tackle in the entire game.